Garage Project – Triple Day of the Dead 2017. Not even the 2018 version, I don’t think this has been in my fridge that long, perhaps I imagined drinking this before. An occasional beer, sporadic even, but one that should be had to go past if you saw it, and of course this year the hand was faster than the eye in putting this in the stash carrier, where clearly the eye overlooked it for a while since then. However like other things this is not a treasure and needs to be enjoyed. 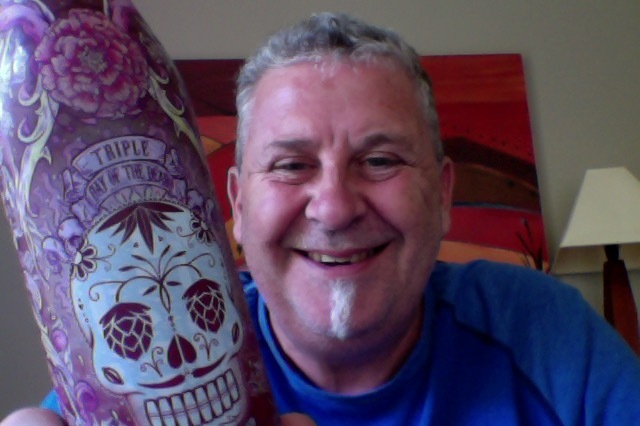 Triple Day of the Dead is a 650ml bottle of beer that is 12.3% ABV, making it about 6.3 standard drinks in NZ, It’s probably at that 370 calories a serve size too. It’s a lager, but definitely not as we know it. Triple Day of the Dead. Black lager inspired by the Aztec beverage xocolatl – this batch brewed extra strong with smoked chipotle chili, cocoa and agave, then aged for over a year in freshly emptied Tequila barrels, and finished on raw cocoa nibs. The last time I had this, the 2016 version, a year ago, it rated a 10 on the scale of things. I’ve drunk a lot of beer since then even if I haven’t written about them. The aroma isn’t that special, it’s chocolate aroma is apparent though.. The pour is like old dark oak or mahogany brown, with a head that made a fleeing appearance, not enough to bother the scorers though. You could be confused into thinking this was a porter given that aroma, but I know it isn’t, right? That is a full mouthfeel beer from the get go, with a chilli heat prickle instantly there not burning your eyes open there, but there’s some heat obvious. There’s also this cushion of sweetness that carries both to the finish that rinses to the end leaving you wonder what the heck just happened. There really is a fruitless about this, and the aroma as you lift to sup is quite intense and makes you want to duck in just that bit quicker. It’s hard to be anything bu impressed with this as a beer, it it really all very well behaved and in tune, there aroma is gorgeous, the fullness of the mouthfeel, the prickle from the chipotle chili, the softness from the cocoa and the agave giving it that Tequila alcohol edginess. As it warms that alcohol note gets throatier, and I feel I’m getting old when I say that the whole bottle seems quite a big journey for the one person, but I’m pushing through the self doubt and fear. Where did I get it? Liquorland in Forrest Hill I believe, it’s been in the fridge a while. Am I enjoying it? Goodness yes, it is outstanding. Would I share with a friend on a porch and set the world to rights? Absolutely yes, this is a quizzical beer of many facets and layers that you’d be daft to go past. Music for this: ”Noel Gallagher’s High Flying Birds: Discography Playlist on the Spotify player. I’ve really grown to like this particular Gallagher Brothers music output. 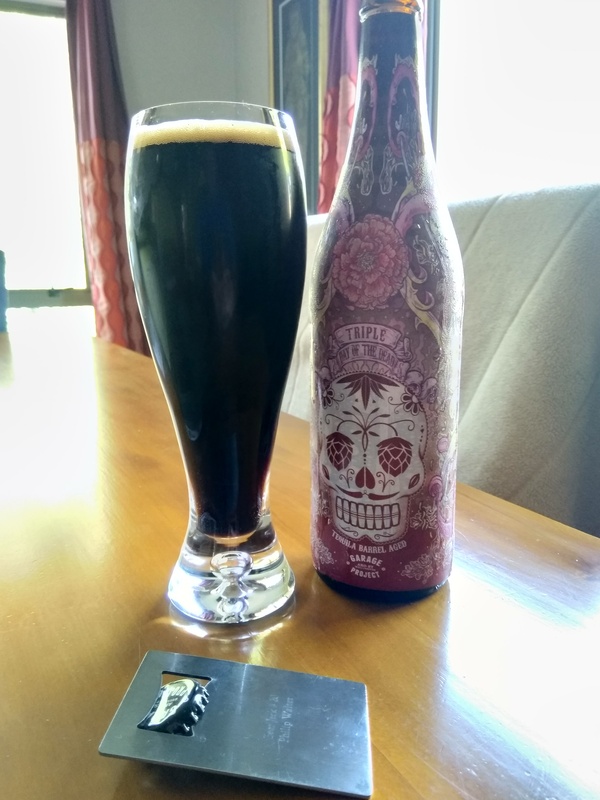 This entry was posted on January 4, 2019 by Philip Walter in Beer, Beer of New Zealand, Beer Review, Brewed By, Craft Beer, Critic, Garage Project, Schwarzbier and tagged Garage Project, Garage Project - Triple Day of the Dead, Garage Project Triple Day of the Dead 2017, Triple Day of the Dead 2017.